The driving force of Service Management is the automation and design of processes that pre-configure action and activities and allocate them to staff, optimising tasks, as well as completion times and management, increasing Service Desk productivity and reducing operative errors. Process Automation allows you to design, organise, automate and monitor the processes involved in managing services, increasing control over activities to carry out and services supplied. 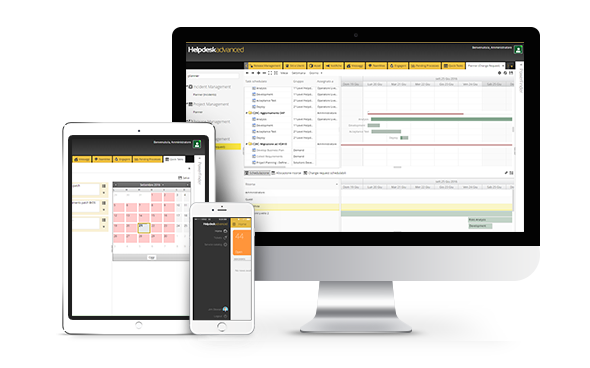 BrainBusiness, the processes orchestration and automation tool at the heart of HelpdeskAdvanced, designs, organises and automates key Service Management processes, offering clear benefits in terms of performance, cost reduction and increased flexibility in connection with the changing demands of IT and business. BrainBusiness involves both external and internal company resources, significantly reducing human error and process completion times, thereby increasing service effectiveness. With BrainBusiness you can create, design and define flows, assign tasks, roles and authority to the relevant resources and departments, as well as create approval cycles, provide connectors to communicate with any Web Service and third-party application, and monitor active processes in real time. Automate processes governing services and approval/authorisation flows for each service type. Improve the operational effectiveness of resources, reducing wasted time and costs. Reduce manual and repetitive tasks by automating activities and tasks and assigning related roles. Continually monitor and control the performance of automated processes behind the services provided.